This page is optimistically titled as in fact I’ve only written one book to date. ‘First Contact’ (Eye Books 2002) is the story of the best trip I’ve ever been on, when Bruce Parry and I set off in late 1999 to cross the island of New Guinea via the unclimbed south face of Puncak Mandala (4700m), Australasia’s third highest mountain. It took us 76 days of hard travel just to reach the foot of the mountain, paddling a huge dugout for weeks upriver, then on foot through West Papua’s lowland swamp forest and ridiculously steep foothills until finally hauling our suppurating carcasses up Mandala’s ‘stupendous abyss’ with no more climbing equipment than a rope and few slings. During what was the most extraordinarily physical journey I have ever experienced we used grappling hooks to cross the many rivers in our path, suffered appalling foot rot in the swamps, contracted every strain of malaria going and had almost daily near-death experiences amidst the rivers, ravines and cliffs. When finally we reappeared from the jungle after 3 months we had been forced to cut short our journey and were minus roughly a third of our body weight. But it was the people we met along the way who really made it truly remarkable. Our route to the mountain brought us into contact with several tribes including the ex head-hunting Asmat and the hilltop dwelling Una, but a huge surprise was in store for us between the those two in the northern fringes of the Korowai. We didn’t know then that a Dutch missionary had been trying to get into this area for 30 years and was still met with a hail of arrows. We didn’t even know then, or at least didn’t believe it, that there were un-contacted peoples still left on the planet, let alone cannibal tribes. What we experienced in that forest forced us both to completely rethink our view of the world. I won’t say any more…you’ll have to read the book, or watch the multi award-winning film we made of the expedition, ‘Crampons & Cannibals’ which comes in a DVD attached to the back cover. Interestingly, years after writing this book, I went to live with the similarly cannibalistic Kombai people for the Discovery Channel series ‘Living with the Kombai’. These wonderfully hospitable people live almost identical lives to the Korowai in roughly the same part of West Papua, moving around between sago swamps, living in tree houses, hunting with bow and arrow and still using stone axes. Amongst the team of local helpers assisting the film crew there was a young Korowai lad who translated into Indonesian the various parts of Bruce’s and my film that were in his language, and in particular the moment described in the title of this book. Until that moment I had no idea how wise we had been to flee from that scene at the precise moment we did, for the men before us were arguing back and forth over whether or not to kill us. One was adamant that we were evil spirits and must die while another was shouting, “No! We don’t know what they are! Maybe the sky will fall on our heads!” The third man was wavering and we’ll never know how he might have cast his vote had we not chosen that moment to save our festering skins and scarper. 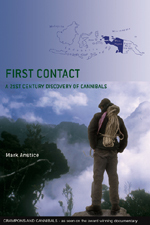 You can buy ‘First Contact’ and get the film too at http://www.canofwormsenterprises.co.uk/authors/mark-anstice/.